My running story began in January of 2001. 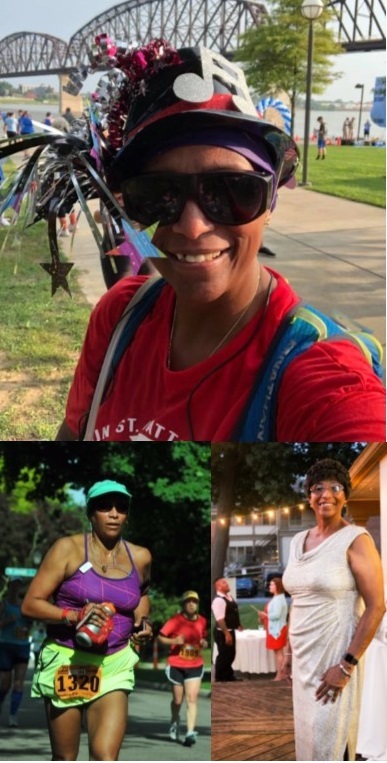 With encouragement from my cousin, Monica Pemberton, I joined a local running group called the Trekos I was 40 years old and had not ever done any running before. The group was preparing for the Triple Crown races, and we met every Saturday for group runs. The Trekos leader kept moving me up into faster pace groups as the weeks progressed. I still wasn’t sure how all of this training was going to play out. But after completing the Rodes City Run, the Papa John’s Ten-Miler, and the Mini-Marathon, I began to feel that I had found a sport that I really enjoyed. Now my focus shifted to a higher goal---a 26.2 mile marathon. In January of 2002, I completed my first marathon at Walt Disney World. I was surprised to learn that my time had qualified me for Boston. In April of 2003, I ran my first Boston Marathon. I went back to Boston two more times. On each occasion, both my Mom and Dad were cheering me on at the finish line. 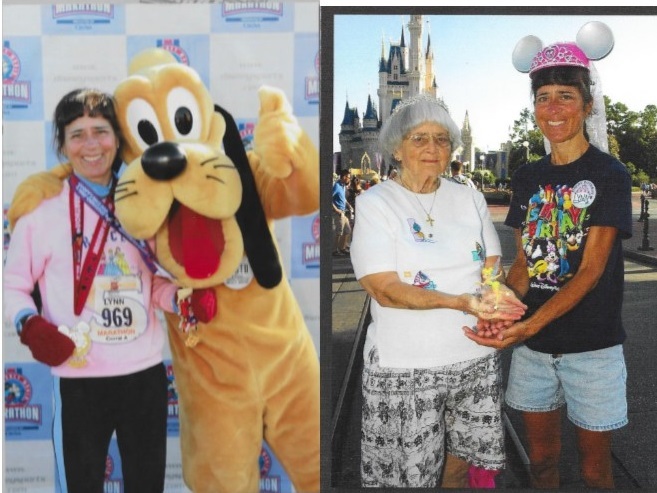 While the Las Vegas and Flying Pig Marathons are two of my favorite venues, I feel most passionate about the many and varied Disney races I have participated in. However, the half-marathon is my favorite distance. My best marathon time has been 3:15:12. My best half-marathon time has been 1:30:35. My best 5K time has been 19:22. For the last six years, I have enjoyed being part of an amazing group of runners that make up our Bourbon Chase team. It is a 200 mile relay event, stretching from Jim Beam in Clermont and following the Bourbon Trail to Lexington, Ky.
By profession, I am a first grade teacher of 36 years in the Jefferson County Public Schools at Foster Traditional Academy. My advice to the running/walking community would be the same advice that I try to instill in my 6 and 7 year old students: always strive for excellence in all you do; set goals; reach for the stars; keep a positive outlook; and never give up. Through the River City Racing events, I have been able to form and build lasting friendships with the local running community. I am so very grateful to all who have encouraged me over the past 17 years. I have found that the River City Racing events are well organized, racing results are promptly recorded, and wonderful staff members make everyone feel welcome and special. So as I close, I encourage runners, as I do my class of first graders, to always challenge yourself to do your best. You may not always win, and everything will not be easy, but if you do your best, then there will be some positive results. Dr. Seuss sums it up well:“You’re off to great places!Today is your day!Your mountain is waiting.So get on your way!”Whatever, that mountain is for you;AIM HIGH.It’s different for each person, but will represent a big goal in your life that is going to take strength, perseverance, and an I CAN DO IT attitude to accomplish. I have come a long way! In my younger days I was a Track & Field sprinter/long jumper. After high school and college, I started running road races including the half marathon because I missed the competition. It was in the late 80’s I stopped running due to several life events and my health declined. I just was not motivated and never believed I would run again. My life took a negative turn. After several years, about 30, I am now in my late 50’s running again and it will be four years next February 2019. What changed? I had a boss that convinced me to start running again; however, it was pictures of myself, overweight, that really push me to get out and run. So one cold early morning in February I did just that and I am still running most days, sometimes twice in one day. I have lost 35 pounds, feel much better, continue to improve and have met some terrific people. This change has been priceless! As this current year of 2018 comes to a close, my greatest supporter, my girlfriend, will be my lifetime commitment. She has been there from the beginning and I could not have done any of this without her. I run for me, live for her and grateful for the running talent I still have. I may not be as fast or strong, but I win every time I finish a race Thank you to all of those who believed in me! I started running in Feb 2009! People often ask me why I started running - I was just looking for something different to do. All my life I was a complete couch potato. I had gone to weight watchers in 2006 and lost weight. They introduced me to exercise. So, I was doing 30 minute video workouts a few times a week. I walked almost every day for about a mile or two. But I was getting bored of my routine. One day I was at the gym walking on the treadmill, and some guy got on the machine next to me and ran real fast for 30 minutes!! I was shocked - I had never seen anyone run before. I guess I never paid attention to people running on the streets. And, I knew nothing about races. I thought marathons were just for professional athletes. I never knew “common folks” did races. After I saw that treadmill guy run, I started paying attention - lots of people were running. I was curious, lol, so I thought I’d give it a try. I couldn’t run for 30 seconds, LOL. But I didn’t give up - I was determined to conquer the beast. I started using “mind games” with myself. I would use my music as my guide. I would run for a few words, then walk a few words. Got to where I could run a whole verse and walk the rest of the song. Then one day I was able to run the ENTIRE song!! I was SO proud of myself!! Then I would run a song, walk a song! And I progressed from there. I entered my first 5K race in May 2009. It was a trail race of all things, lol. I had never been on a trail in my life!! I didn’t know what a “trail” meant. I figured it couldn’t be too much different from the treadmill??? Boy, what an education I got that day, LOL!! I stayed around to see the awards after the race ended and turned out I had won 1st place in my age group!! I was beyond shocked!! Then, I found out I was the only one in my age group, LOL!! But still, I was SO proud of my trophy!! Still have it sitting on my dresser to this day! SO... needless to say, I was hooked!! I’ve been out running ever since. I’m one of those crazy people that will literally go out and try any distance. The longest I’ve run is 75 miles, in my 2nd attempt at the Indiana 100 Miler. I’ll get there some day. My favorite distance is the Marathon. I think because it’s never the same, and it’s always a challenge to finish - no matter how many you’ve run, it somehow always seems brand new. Or, maybe I’m just doing it wrong, lol. But the accomplishment of finishing brings joy to my soul! I am new to River City Races!! I literally JUST found out about River City Races a couple months ago - though a Facebook post on my running friends page! I was like, HOW did I not know about this??? OH MY GOSH, I have had so much fun doing the Run the 502 race series!!! River City Races is like a community of friends running together. I LOVE that! I have met a LOT of really great folks while at these races! I keep looking forward to the next race! And all of the races have been very well organized, and just fun! I love having fun - it’s why I run!! I love playing my music while I run too. I was apprehensive at first, because I don’t want to annoy anyone or ruin their race experience. But I’ve found that people seem to really enjoy to music. I love hearing folks singing along to the oldies - as they “pass” me on the course, lol. My running advice... “Keep it fun”! I run for me. Even if you like setting goals training hard, don’t ever allow your running to stop being “fun”. With all the “stressors” in life, we don’t need to let running become one of them. Life is short - go out and enjoy a nice run!! I began running in July 2016. I was 50 pounds overweight and unhappy and I was desperate to make healthy changes in my life both for myself and for my girlfriend (now fiance) Susan. I decided one day to download "Couch to 5K" and give it a try. It was hard at first, each run was slow and painful and the diet and lifestyle choices that accompanied it were difficult. I was running for a minute and walking for three minutes after that and I could barely keep up. I was logging EVERY SINGLE BITE OF FOOD in Weight Watchers and it drove me crazy. A funny thing happened though...it started to work. My weight dropped and my pace per minute right along with it. Runs became easier and longer and I began to feel healthier than I had in a very long time. I had run before but I had never been this dedicated and I certainly had never enjoyed it as much as I was. It was freeing and it made me feel in control of something. I decided to register for my first race ever, the 2016 Great Pumpkin 10K and it went so well that I registered for the 2016-2017 Polar Bear Grand Prix through which I learned about the Louisville Distance Project at Fleet Feet Sports. I signed up for this Run Club and I have never looked back. This fall marks my fourth LDP training season and during my time with the Club, I have run 6 half marathons, multiple shorter distance races and last May I completed my first full Marathon when i crossed the finish at the 2018 flying Pig Marathon in Cincinnati. I'm currently training for the 2018 New York City Marathon on November 4th and a 20 mile trail race on December 1st. I love the marathon distance. There is nothing quite like the feeling of crossing the finish line after running 26.2 miles. You have spent four months running, lifting, stretching, taking ice baths (in WINTER), eating only that which fuels you, and willing your mind and body to run for 26.2 miles...and then you do...and they hang a medal around your neck and not one soul can ever take that accomplishment away from you. I will never BQ but I will always be a marathoner. Do you have any running advice you'd like to share? Put one foot in front of the other and wear your biggest smile, you're doing something good for yourself and you should be incredibly proud of that. If it turns into something deeper and suddenly you're toeing the line at a Marathon, great, but if you make the trip around the Seneca loop twice and then go home, you have done a great thing. Find your tribe and run with them. LDP not only introduced me to proper training, gear, diet, and form, it introduced me to friends. The friends I have made in my time with a run club have shown me kindness, love, and support and without them I would have given this up a long time ago. Why do you like River City Races events? The 2016-2017 Polar Bear Grand Prix was my first RCR event and I was so impressed at how well run it was and how much fun everyone seemed to be having and that hasnt changed. Every time I run a RCR race I have a great time and I meet other people having a great time. Races are the most fun when you feel safe and supported and I have always felt that way with this organization. I would like to thank my fiance Susan. She has been at nearly every finish line I've crossed and is a fantastic runner and ambassador for the spot herself. it is a joy to do this with her.